As one of our prime tours featuring five star deluxe hotels in all cities, the Silk Road tour focuses on the off-the-beaten path areas in west China, part of the ancient Silk Road, where you will sightsee the stunning Mogao Grottoes and experience the unique cultures of the local ethnic minority people along with the beauty of gobi desert in West China. This trip is for those who have been to China before and wish to explore more adventurous destinations in China. the Forbidden City, the largest and most intact conglomeration of ancient structures of the imperial palace. This was the palace for 24 Ming and Qing Dynasty emperors who ruled China for over 500 years. Take a photo stop at the National Center for the Performing Arts, also known as the National Grand Theatre, designed by the French architect Paul Andreu. You will also tour the Summer Palace, the famous resort of Empress Dowager Ci Xi. Feast your eyes on the Long Corridor, Longevity Hill, and Kunming Lake. If time permits, you may also have the opportunity to see pandas at Beijing Zoo located nearby the Summer Palace. Attend a welcome Peking Duck Dinner tonight. The highlight today is a trip to the astonishing Great Wall of China at Juyongguan Pass, one of the most remarkable feats of mankind. After lunch, you will stroll along the Sacred Way guarding the Ming Tombs, lined with different statutes of animals such as lions, elephants, camels and etc. Later in the day, you will make a photo stopover at the Olympic Park where you will view the exterior of the Bird Nest-China National Stadium and Water Cube-China National Aquatic Center. This morning you will take a tour of Hutong (Chinese alleyways) by riding aboard a rickshaw pedicab through the narrow lanes of the old residential quarters. You will have the opportunity to take a glimpse of the local residents’ daily life. After lunch, you will tour the delicately crafted Temple of Heaven, where the emperors used to pray for good harvest. Enjoy the rest of the day for leisure. Enjoy some leisure time this morning before taking a departure transfer to the airport for flight to Dunhuang, an important religious, cultural and trade crossroads on the Silk Road. Upon arrival in Dunhuang, you will be met and taken to tour Min Sha Hill and the Crescent Moon Pool, where you will have the opportunity to take camel ride over the sand dunes. Stay overnight in Dunhuang. The highlight today is a visit to the famed Mogao Grottoes or Mogao Caves, known as the Caves of the Thousand Buddhas. Designated as the World Cultural Heritage Site by the UNESCO, Mogao Caves comprise the largest, most richly endowed, and longest used treasure house of Buddhist art in the world, and represent the great achievement of Buddhist art from the 4th to the 14th century. Many visitors find themselves deeply touched by the immortal works of art. Tonight, you will be transferred to Liuyuan Train Station to board overnight train to Turpan. Upon arrival in Turpan in the morning, you will visit the Karez Well-the amazing ancient underground irrigation system, the ruins of Gao Chang City and Jiao He City. Attend a local minority singing and dancing show in the evening. This morning you will take a tour of the Grape Valley where you will have the opportunity to taste the well-known grapes grown here. Later in the afternoon, you will head for Urumqi, the capital city of the Xinjiang Uygur Autonomous Region and a major hub on the Silk Road in history. Enjoy the rest of the day for leisure. Today’s excursion takes you to the beautiful Lake of Heaven (Tianchi Lake), where you will take a boat ride. Upon returning to the city, you will visit the Historical Museum of Xinjiang Uygur Autonomous Region, which has an extensive collection of Silk Road artifacts and houses the famous mummies of Indo-European ancestry. Enjoy some time at a bustling local bazaar before joining in a special roast lamb dinner in the evening. Enjoy some leisure time before taking a departure transfer to the airport for your flight to Shanghai, China’s largest city (home to 16 million people). 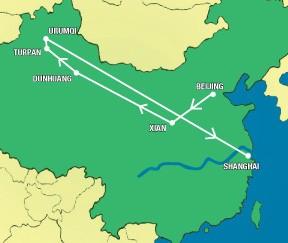 Shanghai is also China’s principal port on a deep estuary of the Yangtze River. Often regarded as “the Paris of the East,” Shanghai has retained the flavor of its past European influences. Upon arrival in Shanghai, you will be met and transferred to your hotel for check in. Enjoy the rest of the day for leisure, or join in some optional tours in Shanghai. 24 meals: 12 breakfasts, 6 lunches, 6 dinners including dumpling dinner banquet in Xian, special roast lamb dinner in Urumqi and Shanghai cuisine farewell dinner party. Cultural entertainments: Tang Dynasty dance and music show with dinner in Xian and ethnic minority dance and music show in Turpan. The above international air fares are inclusive of airlines fuel surcharges, and the government imposed taxes and fees including the September 11 security fee. Additional baggage charges may apply. For details about the baggage allowance information, please check www.airchina.us. The tour will pick you up from your hotel lobby in the morning and take you to tour Hutong (Chinese alleyways) by riding aboard a rickshaw pedicab through the narrow lanes of the old residential quarters of Beijing, where you will have the opportunity to have a glimpse of the local residents’ daily life and experience “old” Beijing. Today’s tour will also take you to visit the delicately crafted Temple of Heaven designated as the World Cultural Heritage Site by UNESCO. The Temple of Heaven comprising three groups of constructions used to be the ritual site for the emperors to pray for good harvest.